Focus on the essential. Eurosmart Cosmopolitandeliberately avoids anything superfluous. The design storyof this line of fittings speaks to fans of contemporaryarchitecture, combining modern aesthetics with excellentergonomics and the highest functionality. 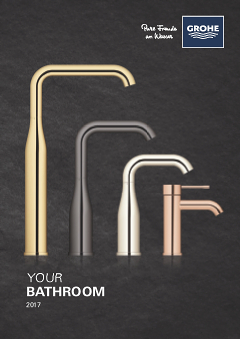 The extensiveEurosmart Cosmopolitan line boasts six different faucetmodels for the washbasin, each brilliantly complementingGROHE ceramics. Whether a fixed, swivel-mountedor electronic cast spout, each model guarantees thehighest GROHE quality and optimum ease of use.Our proven technologies, including GROHE SilkMove®,GROHE SilkMove® ES and GROHE StarLight®, arecommitted to fulfilling our quality promise.